and here is another fun idea: one of the first threading activities for your toddler, before they start with a thread and a needle. Cut craft foam leaves into various shapes (I made triangles, squares, rectangles and a circle). Punch several holes into these craft foam shapes using a paper hole punch. Offer them to your toddler together with a bunch of pipe cleaners. 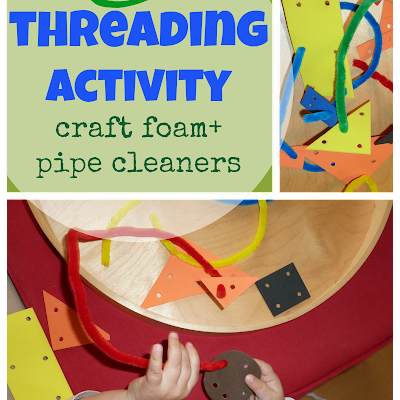 Here it is, a nice fine motor activity for your toddler.